A shop built staircase, is simply a staircase that is built in our shop and then delivered to your house as one complete unit. When we build a staircase in our shop we have all the resources that we need to make any staircase a reality. One of the best arguments for a shop built staircase is the overall quality of the stair. 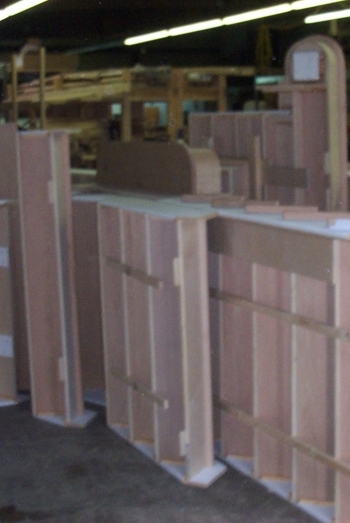 Shop built staircases are assembled using a proven process that allows us to meet your houses exact specifications. More importantly if your stair design will not work as drawn, we have the ability to offer solutions well before it's to late or to costly. The techniques used to construct a shop built staircase have a number of benifits, including being able to use screws instead of nails, make hidden joints, and use routered stringers. One of the best arguments for a shop built stair is the overall cost. Building your staircase in our shop eliminates the cost of transporting, unloading and setting up a mobile shop each day. Simply put, when we build a staircase in our shop, we have greater control over everything from start to finish.